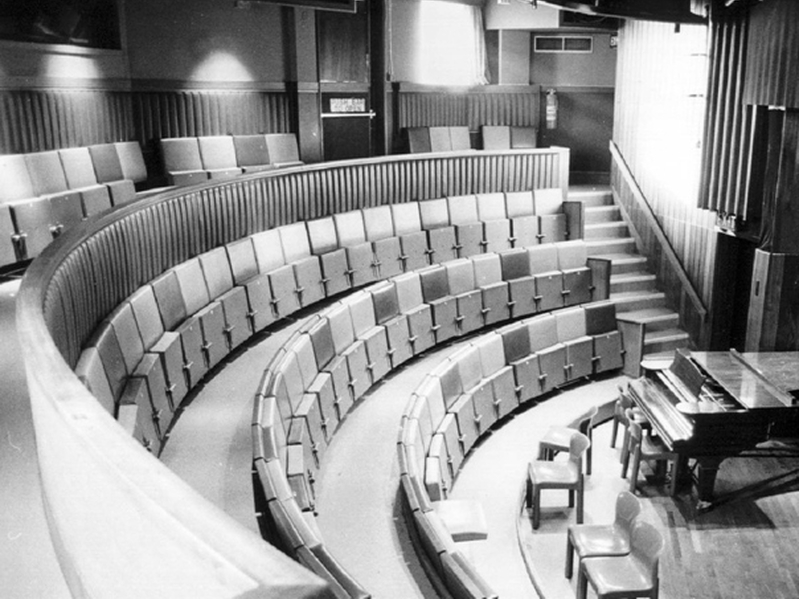 MAC, founded in 1962 as the Midlands Arts Centre for Young People, owes its existence to the vision of Councillor Sir Frank Price and John English, a former industrial chemist with a passion for theatre and the arts. 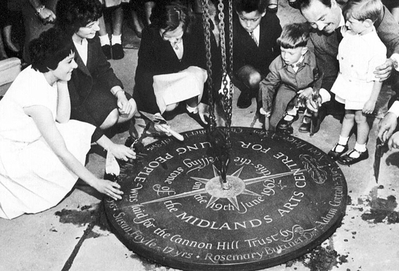 English and his wife Alicia (Mollie) Randle were active in the Birmingham amateur theatre world and in the 1950s formed a small touring company to explore their ideas about introducing young people to the practice and traditions of theatre. Out of this they developed the novel concept of a permanent arts centre for young people offering practical experience of a wide range of art forms. The project received strong support from Birmingham City Council, which provided the 8.6 acre site in Cannon Hill Park. 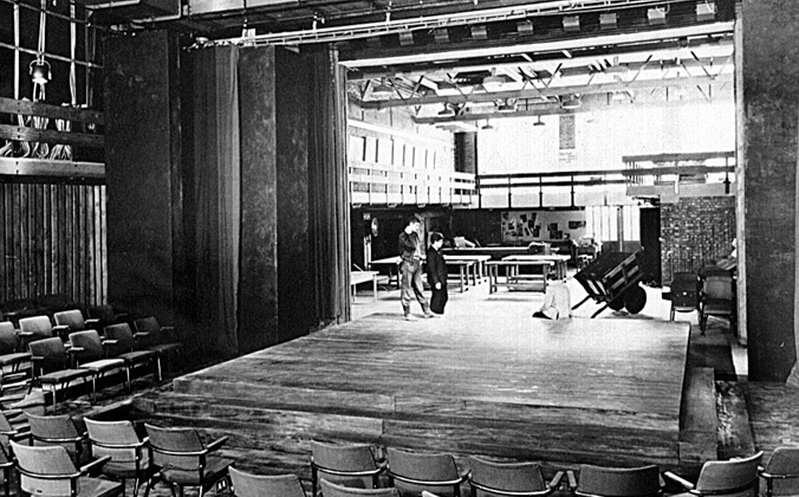 A number of buildings, including studios and two small theatres, was completed by the mid-1960s, while the outdoor Arena theatre was added with the aid of young international volunteers taking part in work camps. When MAC opened its creative resources included a professional theatre company as well as one of the UK's few full-time companies of puppet makers and puppeteers. Led by John M Blundall, acknowledged as one of Britain's authorities on puppetry, the Cannon Hill Puppet Theatre over its 30 year history gave many thousands of schoolchildren their first experience of theatre, and created an important legacy through the many artists it trained. Well-known actors and directors who gained experience in the early years of mac included Tony Robinson, Jean Boht, Lesley Josephs, Imelda Staunton, and Bob Peck, whilst Adrian Lester was a member of the Birmingham Youth Theatre, which was resident at MAC from 1972 until 1987. Celebrated film and theatre director Mike Leigh carried out some of his earliest experiments in improvisation with young people at MAC in the late 1960s. Visual artists and craft makers who left their mark on MAC include Yoko Ono, Kate Malone and Ewen Henderson whilst many of Birmingham’s celebrated musicians and bands including Ruby Turner, Ocean Colour Scene, UB40 and ELO, count playing MAC as one of their formative experiences. Over its first four decades mac made various additions and changes to the original buildings while gradually adapting its artistic policies to Birmingham's changing cultural landscape. The distinguished Indian classical dancer Nahid Siddiqui, then a Birmingham resident, taught Kathak classes, later forming a touring company from her students. Renowned Bharatanatyam exponent Chitra Bolar began teaching at the centre in 1978 and has since developed both her own very successful company and other independent dance artists. This helped establish MAC's reputation as a centre for South Asian dance and performing arts, and when sampad, the national South Asian arts agency, was created in 1990 it became first a tenant of MAC and then a partner in its redevelopment project. Though MAC was no longer aimed exclusively at children and young people they remained an important focus of its activities, notably in a distinguished series of community music theatre productions that in the 1990s were integrated with the Simon Rattle-inspired Towards the Millennium festival. Productions which helped trace the arts through the decades of the 20th century ranged from Hans Krasa's Brundibar, a children's opera written and first staged in the Terezin concentration camp in the 1940s, to Pink Floyd's The Wall from the 1970s. Another noteworthy development in the 1990s was the annual spring festival Moving Parts, which explored new developments in the fields of dance, physical and visual theatre. An important element of this was the encouragement of emerging talent from the West Midlands, which led to the ongoing relationship with the now internationally acclaimed Birmingham company, Stan's Cafe. By the end of the century MAC was well established as a much-loved institution used by 500,000 visitors a year who were attracted by live performance, independent cinema, exhibitions and special events, or by the opportunity to try out a wide range of practical classes from music tuition to ceramics and jewellery-making. However, it was also apparent that the buildings and their plant were becoming worn out. The growth of the centre in a series of short, unco-ordinated bursts had also led to a confusing and inconvenient layout with generally small spaces, many different levels and a lack of disabled access. Plans for a major redevelopment of the site began to be drawn up as long ago as 1992. Dorothy Wilson took the helm as Artistic Director in 1990 and also as Chief Executive in 1998 and it was her vision, tenacity and leadership that steered MAC through a long saga of funding setbacks and returns to the drawing board before work finally began in April 2008. Just two years later, MAC was back to face the challenges and opportunities of the future with the facilities to match its ambitions and the needs of its artists and audiences.